A gear coupling is a power transmission coupling which uses a hub with gear teeth on the outside diameter of the input shaft. Like hub on the output shaft is connected by a flange or a sleeve with teeth on the inside diameter, to transmit torque and to accommodate shaft misalignment. This coupling is usually all metal in construction does require lubrication, is very rigid torosionally, and can transmit high torque through relatively small packages. A coupling comprises a clutch having an input connection to the power take off and an output for connection to power transmission input of the trailer unit. The tension in the coupling when it connects the tractor and trailer units is monitored, and the slippage of the clutch is controlled in response to the monitored tension. This is required so as to maintain the speed at which the trailer unit is driven substantially the same as the speed at which the tractor unit is driven. Flexible Coupling - They couple or connect rotating members such as motors and drive shafts while allowing misalignment in either angular or parallel offset orientation. Coupling types can be sliding block, roller or silent chain. When searching for flexible couplings some mechanical properties are to be considered. These include rated torque, rated speed, torsional stiffness, and backlash. Rated torque is the maximum service torque for which coupling is rated. 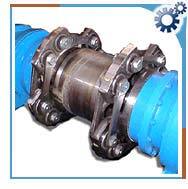 The rated speed is the maximum rated rotational speed of coupling. Stiffness is expressed in torque per unit angular deformation. Backlash is the rotational position loss due to a direction change. Rigid Coupling - Connect or couple rotating members such as shafts. They secure onto both members and provide transmission of torque and motion. They do not allow for angular or parallel misalignment.